Text by Cedric Tassan (English version by Carmen Rey). 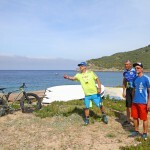 Take two world champion expert trials riders, put them on a boat en-route to Corsica and let’s see what we get with the prefect mix of Hans Rey and Kenny Belaey. But first, while we wait for Kenny to arrive from Belgium I suggest a little ride close to my home in the Calangues. It is black; I cannot breath, I cannot move…as though from a dream I hear Hans’ voice calling me trying to find out if I am OK. The voice is distant. It seems far away. I know that that there is nothing seriously wrong but as I try to scream out to Hans, only a mere whisper sounds from my mouth. My chest is compressed; it feels crushed as though the very rocks I am lying on are laying on me. I am not sure what is more shocking to me, the fact that I may be hurt or the fact that I have just fallen at the feet of The Master which is a little embarrassing. I decide though to be positive, if I cannot come out of my feint to the vision of a beautiful nurse by my side, then to come to with a bike icon making sure I am OK is the next best thing. Rising slowly I realized that I am crippled with pain, the black fog threatened to return. Just moments before I had warned Hans about this passage, I knew that it was hyper technical, rough, rocky, steep and tricky, but even though I was prepared, I wasn’t prepared for the root. Watching me Tumbling down the exposed jagged contours of this mountainside shocked Hans almost as much as me. He was convinced that our journey to Corsica was over before it had even begun, that there was no way that I could have escaped this without serious injury. Although my entire body was pretty sore and I feared that I had broken ribs, with Hans travelling thousands of miles to meet me and Kenny on his way from Belgium, I was determined that this adventure would not be cancelled. Once the multiple world trials champion Mr Belaey arrived it was time to load up our bikes. Both the trials masters have brought with them enduro bikes and trials bikes so my van was pretty full. Off we go to the Port of Marseille in southern France. Since we have a little time to spare we decide to climb the steps to the Notre-Dame-de-la-Garde and make a little pilgrimage to the Virgin Mary statue that looks out over the city and looks after the Maritimers. Hans says a little prayer for safe passage and I can only hope that Our Lady understands Swinglish! Embarking on our ferry it was time to squeeze into our miniscule cabin and considering chilling out for a while, what better way to do that than to look at the incredible view from our ship’s deck as we leave the port of Marseille behind. Whilst lying on my bunk that night, I could only be grateful for the calm waters as I tried not to think too much about my hurting body. After a smooth crossing we arrive in Ajaccio where we meet up with our guide Remy and drive to Sanguinary a rocky point, which is one of the most famous sites on the island. Unfortunately the weather is a disappointment giving us flat light, but no matter we will make do and so we set off on our first bike tour. We follow Remy who sets a good pace through the stunning forests, as we climb the road to the Bocca di Canareccia my body loosens up and I become less aware of the pain I am in. Then comes a twisty and flowy descent through the tight trees. I can see that Hans and Kenny are in Heaven in this natural playground. 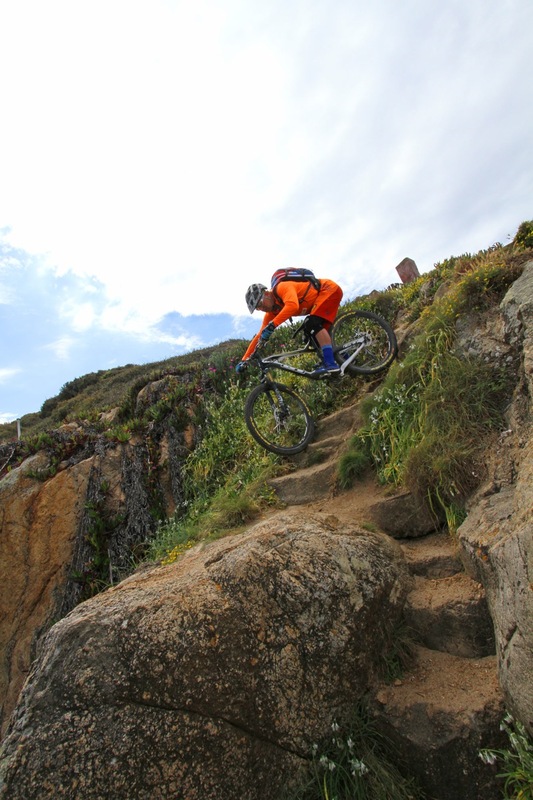 Once at the bottom we arrive at St. Antoine beach where Remy points out a rocky and very steep shortcut trail butting up to the sea, riding the wall 20’ above the ocean seems to be the way to continue to the trail even though it seems a little crazy. Crazy continues as the trail continues with very exposed rocky winding steps that lead into a narrow gully, no room for errors. Although this is a breathtaking sight it is also scary since a fall would mean a drop of 7 or 8m to the rocky beach below. It would have been impossible to photograph the two Trials aficionados riding together; the space was far too tight. So they set off one at a time. I picked my angles to shoot and watched as they implemented all of their Trials techniques; precisely and patiently maneuver, hop and nose wheelies foot by foot their All Mountain Bikes downwards. 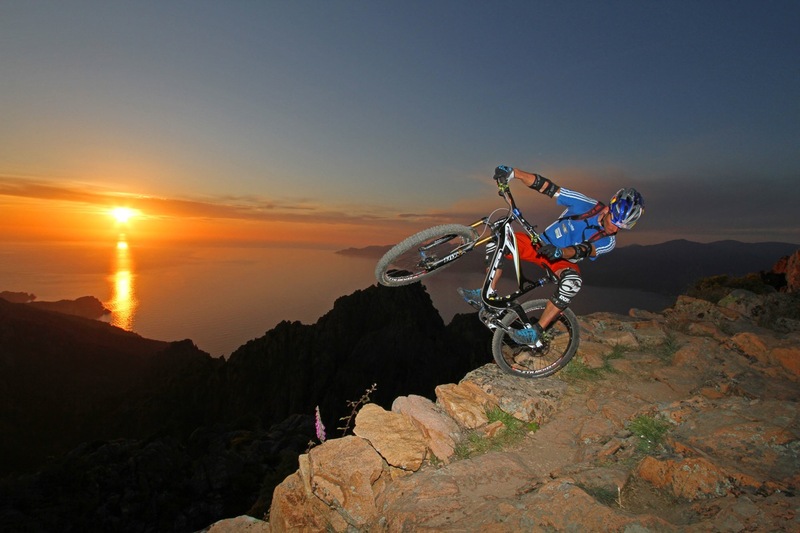 Skills which are beautiful as well as impressive to watch against this stunning backdrop. 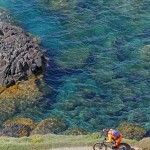 After Kenny rode a beached tree trunk we continued to loop around Minaccia cove to the meadows beyond. 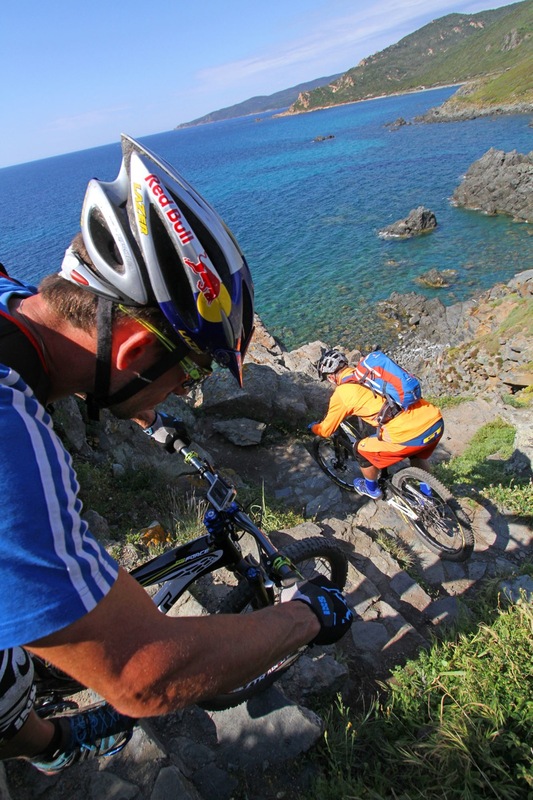 We follow the coastal Corniche path and see just how wild and beautiful Corsica is. After another steep and steady climb we reach the point of Corba and then tackle the fast and rocky descent in a cloud of dust to the Cala di Reta. 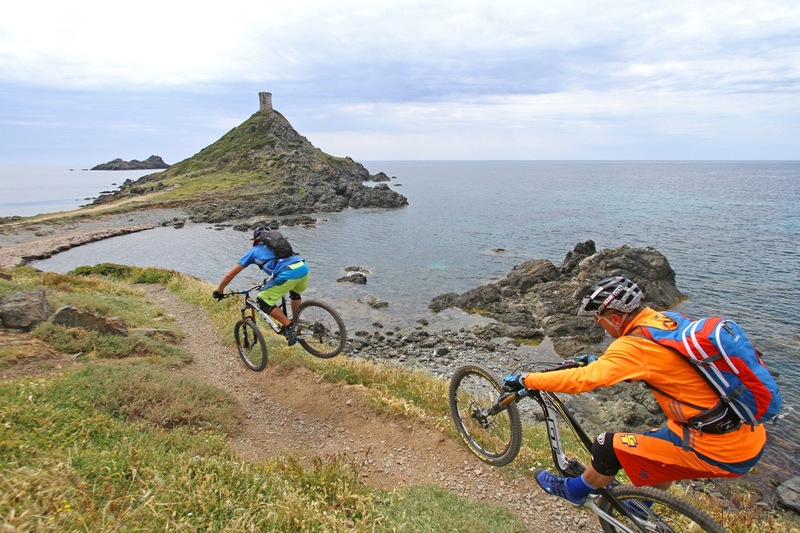 At the tip of this bay is the Parata, a tower and another famous Corsican monument from where we could see many trails looping around us as we took in the 360 degree view. Kenny showed us some of his moves, with his dynamic energy propelling him up steps and rocks. He is a virtuoso who plays on his bike like a musician his instrument. His pedal strokes are rare and only applied at the exact precise moment they are needed, his skills are magic to watch. 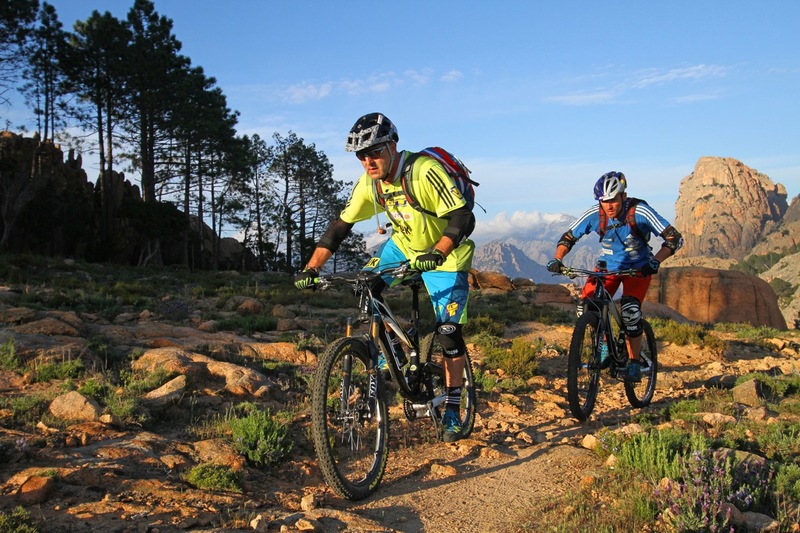 He rode his full suspension bicycle as it was a motocycle. 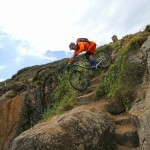 Hans then took the trail down ,tackling the very steep, very technical steps, it was slow going but he cleaned it. It is time to follow Remy again to our camp for the first night. After several kilometers of narrow winding roads we reach a dirt track, which Remy successfully negotiated with his 5m long trailer. We arrive at Lava Beach where there are a few dilapidated huts along with the most spectacular view of the gulf. As the sun sets Hans becomes excited about the prospect of seeing Mercury, apparently tonight it should be visible to the naked eye and this is a rare thing. But even though the sky is clear, we can’t even locate Venus despite the technology of astrological apps on our phones. Time for beer, the local Corsican brew is pretty strong but goes down well at the end of a long day accompanied by sausages, sardines and kebabs. Sitting on the beach, eating and drinking in the company of interesting people we feel like we are on vacation. 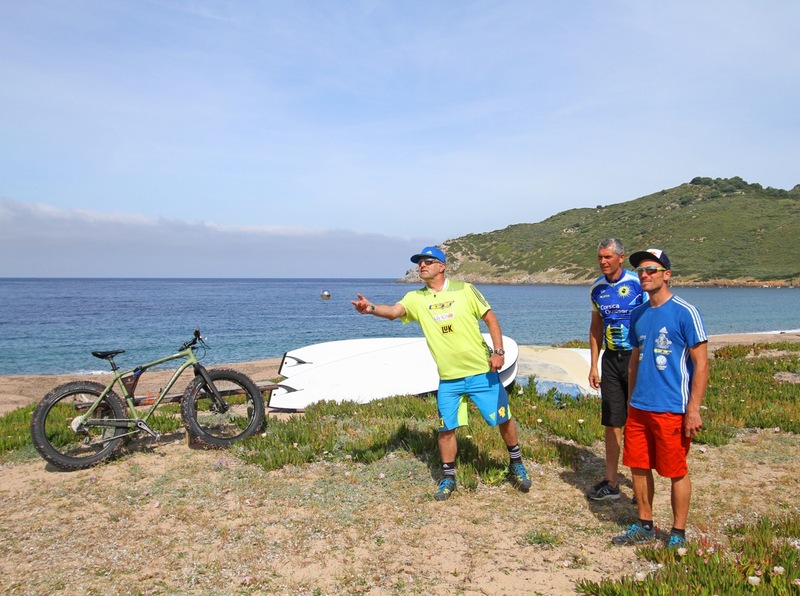 In the morning we managed to squeeze in a little stand up paddle board session and a game of Boules before heading off to our next destination, the village of Piana and the Calanche cliffs which are so incredible they are listed as a UNESCO world heritage site. 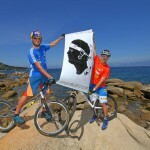 This probably the most famous and busiest place in Corsica and Hans and Kenny are captivated by what they see. We know that the ascension will not be easy, in addition taking photos takes time and so after discussion it is decided that I will leave my bike behind. With a path littered with rocks and still another 450m of elevation to climb, I am thankful many times for this sensible decision. With the smells of Corsican nature accompanying us we are grateful for the shade of the forest until we reach the Piazza Moninca where the granite boulders on the trail give way to beautiful flowered scrubland with pink rocks as a backdrop. 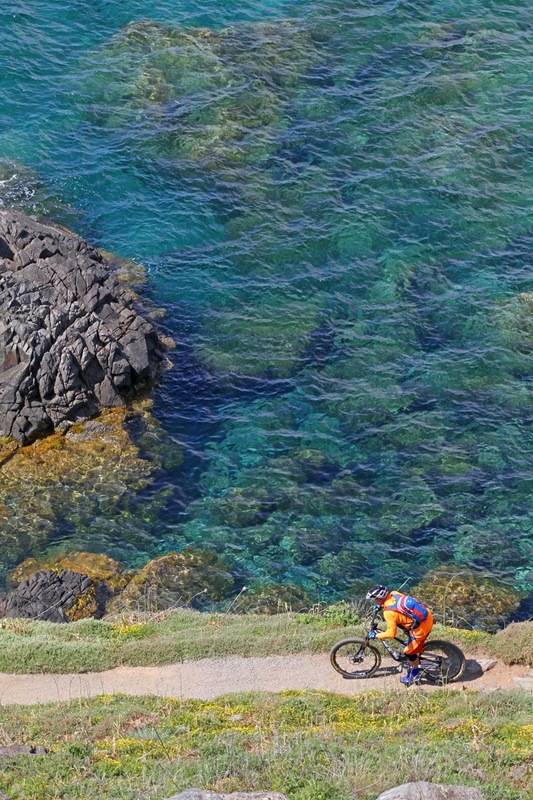 There are many terrains I will attempt on a bike, but quite frankly, unless you have the trials skills of Hans and Kenny, attempting this trail would be simply insane. Continuing our arduous climb we see no one but a few hikers, we are conscious of the need to press on if we are to make the most of the light for our photos. Once at the summit of Capu d’Orto we are stunned by the view from our perch 1300m above the ocean. 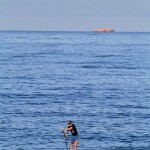 Our eyes take in the sights of the Gulf of Porto, snow capped mountains, the gorges of Spelunca and the Gulf of Sagone. 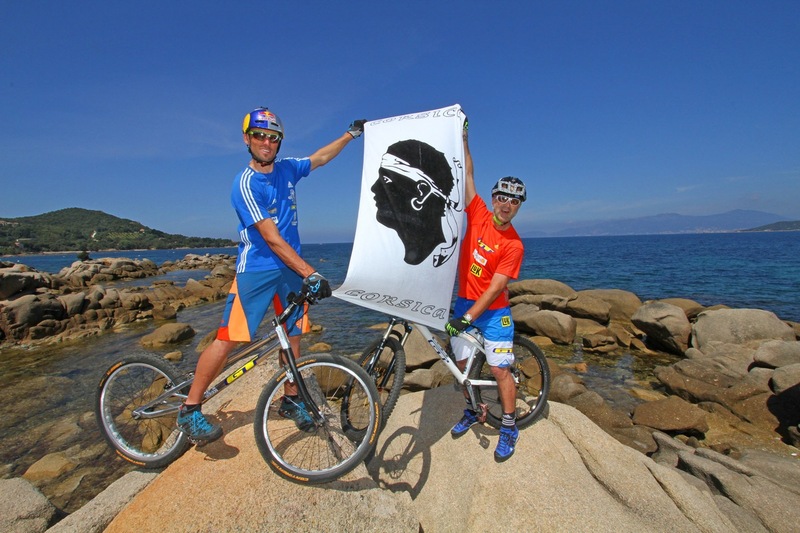 Corsica may be just a small piece of France but this island has a lot of diversity, it is simply fantastic! Hans and Kenny prepare for another treacherous descent; right at the beginning Hans jumped a huge rock, which even Kenny was not comfortable with. 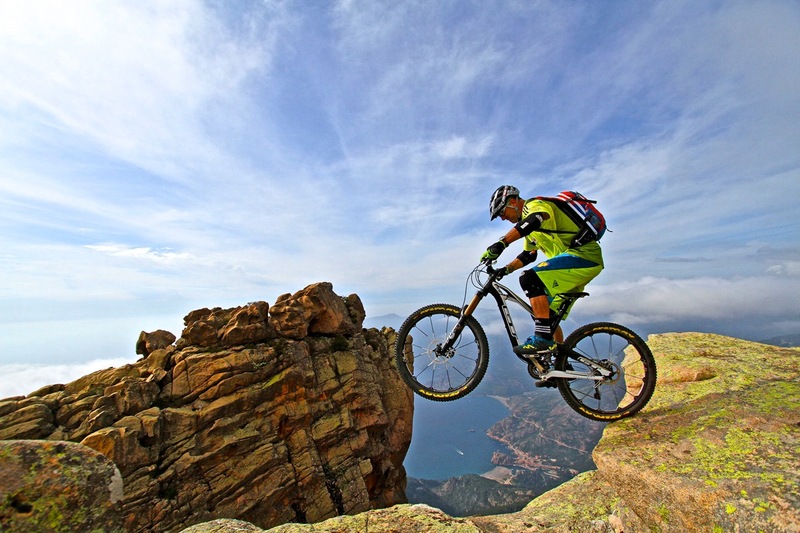 It is interesting to see that these riders know and respect their limits; they have incredible skills but remain modest. 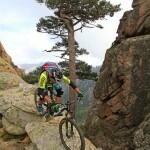 There can only be a few riders in the world that could ride this trialsy trail without setting a foot down. Challenges like these continue to validate and identify the talent of Hans and his GT Team mate and how they are true practitioners of their trade. 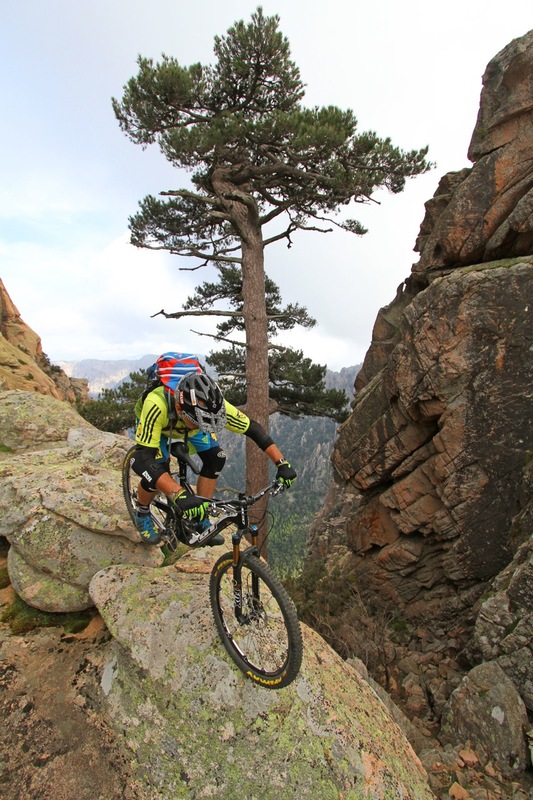 Although the slabs of rock along the way are big and have a steep camber, the granite makes them grippy and the riders have plenty of lines to choose from. After a time we are back at the place where my bike lays hidden and thankfully it is still there. We proceed on but after a while it became evident that we are lost. No problem, I pull out my phone and use my VTOPO application, with speed and accuracy it pinpointed our location and we were able to find our way back to the path with little time lost. Although the trail is tricky, it is also fun and beautiful, but we are running out of time, the sun is low and so there is no more time for more photos. Kenny is on a mission, he almost cleans the last 20 switchbaks in the dark, it was very hard and everybody was exhausted. At 20:30 we arrive at Calangues, which is where we will end our riding for the day, the light is magical and it is time for the last shots before dark. Everyone is exhausted and thirsty but no one complains. But as the light faded we were happy to board the van and head back to Piana for dinner prior to our long drive back to Ajaccio that night where comfy beds would be waiting for our bone weary bodies. 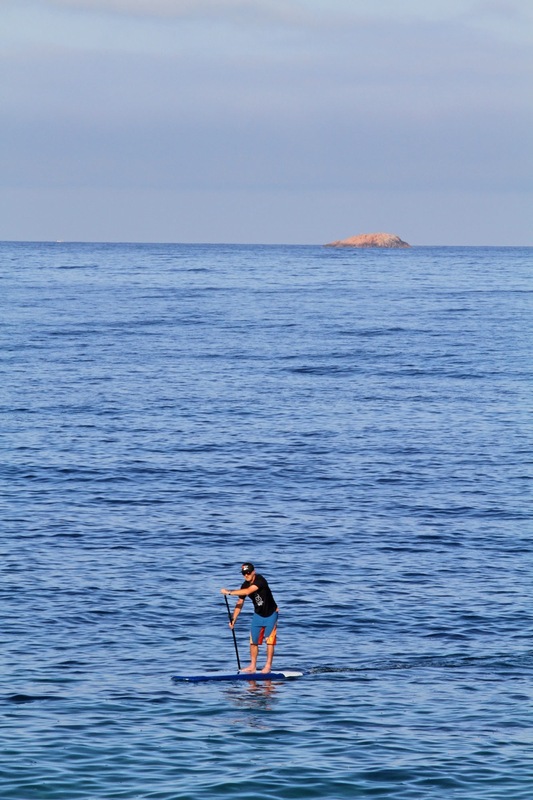 The next morning was set aside for some pure trials time, south side of Ajaccio you will find Verghia where there are huge granite slabs lain in the sea. Trials moves always take concentration, precision, focus and skill, even with all of this in place it is possible for error to occur. Kenny fell between two rocks, a gap which saw him land in the ocean, but very thankfully he was not injured. I’m still amazed by some of the moves Kenny pulled on that beach, sometimes its was hard to comprehend, even after watching him do the same move over and over. Like this rock that was 130cm/51” tall with a 150cm/60” gap before it. Hopping from standstill position on his backwheel up the vertical rockface, placing his front on the edge of the obstacle , while engaging immediately into a second move that lands him on top of the rock with both wheels. Not even the best basketball players good do such a vertical leap. 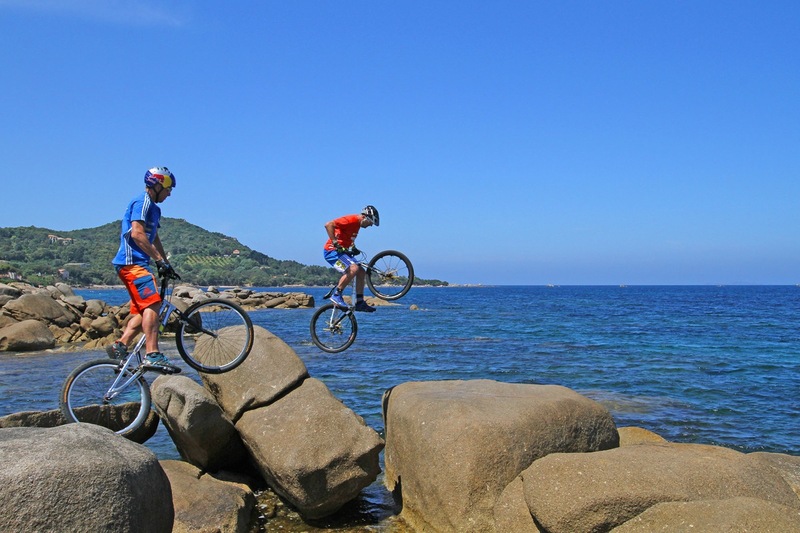 After Hans and Kenny showed off a little of their trials know how it was time to loosen up, change bikes and embrace the Enduro culture at the Enduro mecca of Corsica, Coti-Chiavari. There is a fire road so as well as ride it is possible to be shuttled to the top; there are numerous single trails so I would recommend having a guide with you. 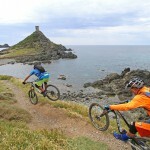 This was the perfect end to our Trials on Trails trip to Corsica. It was time to head back to the beginning as we board our ferry in Ajaccio on course for Sanguinary. But as I lay in bed that night I felt the disappointment of a missed opportunity. Why hadn’t I photographed the two Trialists doing their thing on the deck of this giant ship? Like a crazy person I leapt out of bed and broached the subject to Hans and Kenny, c’est possible, n’est pas? Of course it would be possible for them to ride…if the Captain agreed. So with a “Sorry to bother you at this hour, but we have a strange request” etc etc, we propositioned the boss of the boat. He seemed a little bemused and amused but he agreed to give us a time slot at 6am to do our on deck session. The next morning under the close supervision of the ship’s staff we took our bikes from their location stowed in the belly of the boat, a place normally forbidden to passengers during the crossing. As we are approaching the harbor I frame the riders with the Chateau d’If in the background, it is pretty incredible. Our time together however had not quite come to an end. After a little relaxation at my house we set off to meet Kenny who was having a training session around the rocks where I had sent him thinking it would be a great place for some trials. After days in Corsica carrying my professional camera equipment, I now found myself with the potential of possibly the best content for pictures from the whole trip and yet all I had with me was my i-Phone. I was witnessing the Master, Hans Rey giving advice and mentoring the winningest UCI trials rider of all time Kenny Belaey. This was quite an image, even though it was done in jest, the pioneer and legend, the bike adventurer Hans conspiring with super talent Kenny to have a little chuckle, keeping it real and ensuring that Trials is still relevant, not just today, but on into the future.